Jonathan C. Brandt is a Certified Financial Planner™ professional and has been the owner of Journey Tree Financial Planning and Investments since 1993. Jonathan is a past president of the Financial Planning Association (FPA), Mid-Oregon Chapter, and founded its annual Spring Symposium. In addition to extensive professional reading, he attends over 40 hours of financial planning and investment seminars per year. While providing financial planning management to his local clients, he has also shared his expertise across the state and in publications, including The Wall Street Journal. Jonathan has a Bachelor’s degree in Economics and Political Science from the University of Iowa. 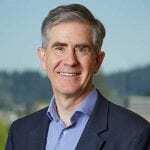 He has been active in a number of community organizations in Eugene since 1988, serving as president of the Eugene Gleemen, Willamette Repertory Theatre, and the Eugene Tree Foundation. He currently serves on the statewide board of Friends of Trees.